As we planned the 2012 -1812 interpretive program and refined the ambitious tour schedule designed to bring the causes of the War of 1812 and the first season’s story to communities around the region, we realized we had an opportunity to conclude the program with a “Welcome Home” event at Vergennes. 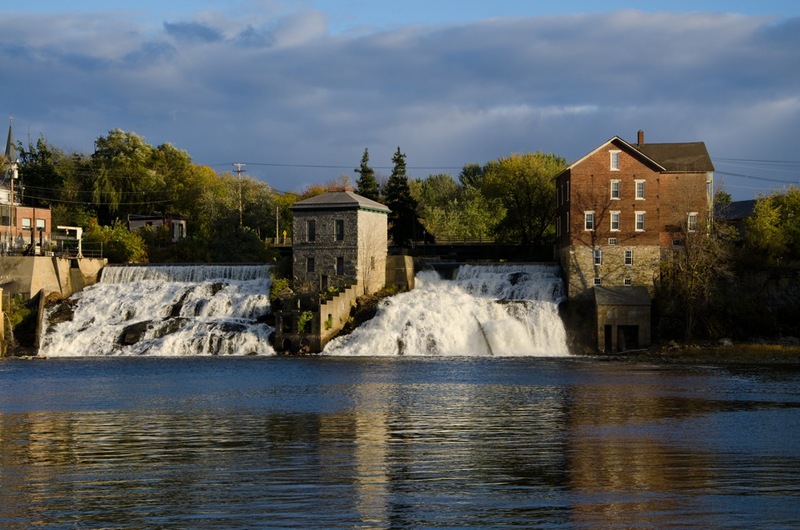 Vergennes is one of our “homeport” communities and Vergennes has an intimate connection to the War of 1812. It was here during the winter of 1814 that the resourceful Commodore Macdonough and master New York City shipwrights Adam and Noah Brown created the principal vessels of the American fleet that would do battle with its British counterpart for control of Lake Champlain. We saw an opportunity to utilize our final public stop at Vergennes to provide the perfect ending to 1812 and a way to look ahead to the conflicts next two years. Everyone we spoke to loved the idea of doing the “Welcome Home” program in Vergennes and as we worked to maximize the impact of the whole tour, we continued to refine the way we might bring it all together at the end. 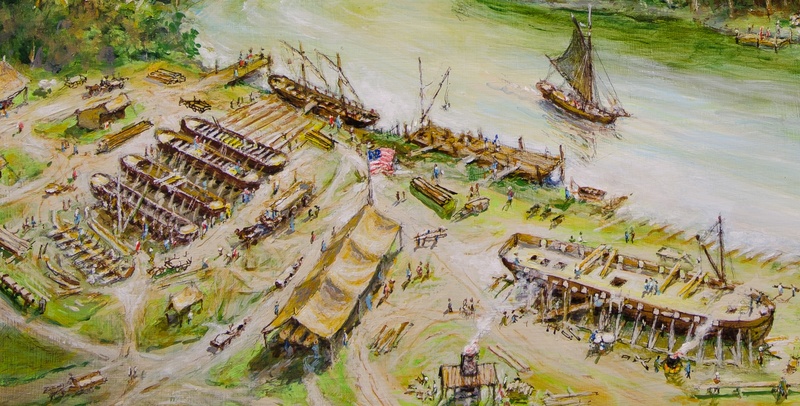 The combination of a stop in Essex, New York followed by a final stop at Vergennes was the opportunity to focus on the wooden ships utilized to secure Lake Champlain. In 1812, when Lt. Macdonough arrived on the lake, he had two older gunboats supplemented by a force composed of converted lake sloops, many of whom had been built in Essex, NY. As the war progressed and it became more likely that 1814 would bring a contest for the lake’s control, Macdonough’s shipbuilding efforts at Vergennes took center stage. The Battle of Lake Champlain at Plattsburgh took place on September 11, 1814 where these Vergennes built ships saw intense action and won the battle that helped end the war. Being able to tell that story in two communities directly connected to the vessels of the fleet would serve our mission in a profound way. Upon arriving back on the lake after four months away, we put Lois’s sailing rig up at Port Henry for the hoped for sailed to Essex. I am pleased to report that for once, the wind did not disappoint. 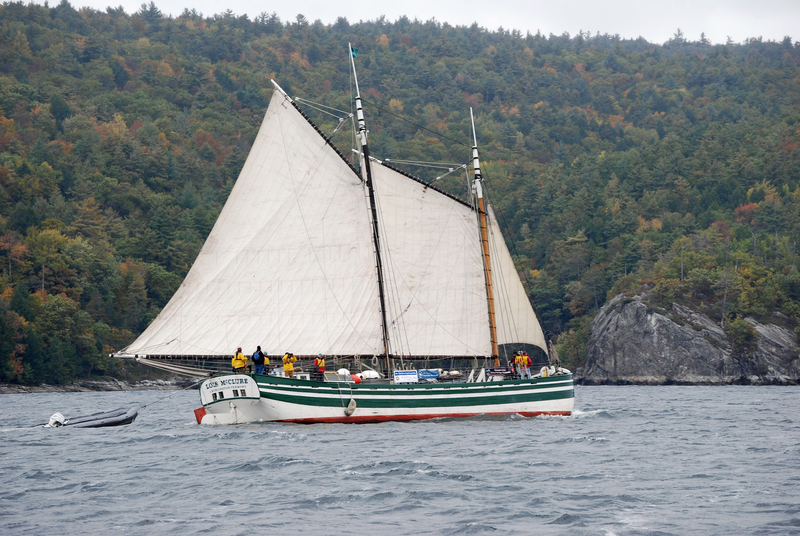 The sail north was pronounced by our experienced crew as the best ever. As always, I had the best seat aboard the tugboat CL Churchill and with crewman Kerry Batdorf we had a great viewing and photography platform as the schooner made her way north. We always love returning to Essex, the community that still reflects its 19th century commercial heritage in its remarkably preserved architecture. We were able to host an enthusiastic school program from Willsboro and visit with many good friends during our stay. On Friday morning, so pleased with our stay in Essex, we were joined by LCMM Board Chair and veteran crewperson Darcey Hale. We left the dock at Essex and headed southeast to the entrance of the Otter Creek that leads to Vergennes. It was a beautiful early winter day with a cold chill in the air that reminded us how tough the mariners of yesterday had to be to work the lake often into December. Traveling the lake, canal and river in November and December added the intensive effort of fighting the cold and reinforced the necessity of the wood/coal stoves that we find in each canal boat shipwrecks cabin. It also re-connected us to our Captain Theodore Bartley who was forever reporting in his fall journal how much ice had been made in the pail overnight. For us, knowing we were approaching the end of our journey, our good memories of people and places we had come to know combined with our cabin stove, provided a warmth and satisfaction that encouraged us in this final leg. As we approached Vergennes, the excitement and satisfaction of concluding the 2012 program here while setting the stage for the next two years felt just right. The lake and Otter Creek were in full color as we passed Fort Cassin, the fortified entrance to the creek. It was here that a battery of (7) -12 pounder cannons mounted in an earthwork was able to turn back a British raid on May, 14th, 1814. The British had hoped to destroy Macdonough’s fleet before it could leave the river, but were repulsed by the determined fire of the battery and strong showing of the Vermont militia. The British objective to weaken or destroy Macdonough’s fleet or sink vessels to obstruct the entrance to Otter Creek failed and the British returned to their base at Isle aux Noix. In light of the complete American success that soon followed at Plattsburgh Bay, the British raid was right to try to attempt to pre-empt the American fleet. The American naval victory was decisive and brought the war to a negotiated close. This great legacy of history combined with the days extraordinary beauty treated the crew to a memorable trip down this beautiful waterway to Vergennes. Arriving just below the magnificent Vergennes falls, we were greeted at the dock by a small crowd of LCMM staff and folks from the community who were there to help welcome us home. Jim Larrow, Vergennes Public Works director, was one of the first to come aboard. It was Jim and his crew who had taken such great care of us and all the boaters at the Falls Basin during 2011’s Hurricane Irene. Jim was at the dock to welcome us back and make sure we had power, secure docks and everything else we needed to support our 3-day stay, our 41st community program since spring. With the schooner secured to the dock, our ramps set out to shore, our banners placed on the walking path that leads from the parking lot to the schooner, we all began to focus on the dynamic “Welcome Home” event that had begun with an idea so many months and miles ago. The event had been organized by Representative Diane Lanpher with assistance from Megan Smith, Commissioner of Vermont Tourism and Marketing and Erick Tichonuk, Co-Director of LCMM. We had great support from Mayor Mike Daniels, Cabot, Dakin Farms, and the Addison County Chamber of Commerce. Despite the cold temperatures, as the appointed hour got closer the dignitaries and crowd began to arrive. 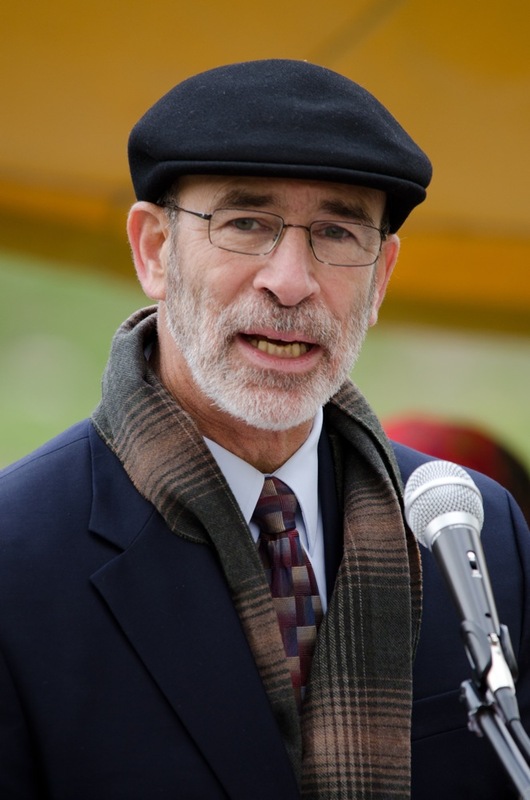 The Honorable Aaron Annable would be representing the Government of Canada and the Honorable Andrew Parker the Government of the United States. Our own Governor Peter Shumlin was there representing Vermont, along with Representatives Michele Consejo, Dave Sharpe and Diane Lamphaer all who had done so much to help make our program happen, Diane Derby representing our Senator Patrick Leahy and Mayor Mike Daniels hosting us from Vergennes added their warm welcome to the crew and the crowd. Erick hosted the event as MC and at 1:00, a series of wonderful remarks about our trip and War of 1812 history and the impact of that conflict were presented. I was pleased to talk about 1812 and the Vergennes role in 1814 as the place where McDonough’s American fleet was built. I must admit, I had been hoping for one of those Indian Summer days when the warm temperatures and golden colors combine to bless the earth, but instead we got the coldest day yet this fall. However, despite the cold temperatures, the event met all my expectations and exceeded many. The gathering of people coming together to remember the events of the War of 1812 and the peace that we have enjoyed since, was truly the perfect conclusion to this wonderful journey.